NB: The rack ears are an optional extra purchase. Designed to work seamlessly with PreSonus® StudioLive® Series III console/recorders the PreSonus NSB 16.8 is an 16-in, 8-out stage box that sets up quickly and easily to route signals from stage to mixer over an AVB network. With AVB networking, all signals flow through one lightweight CAT5e or CAT6 Ethernet cable, eliminating the need for a heavy, expensive copper snake—and the signal degradation that goes with long analog cable runs. You can even remote control the NSB 16.8’s inputs, preamps, and phantom power from your networked Series III console or from free PreSonus UC Surface touch-control software. A stage box is all about analog connectivity, and the NSB 16.8 gives you all the I/O you need and then some. You get 16 locking combo mic/line inputs equipped with our famous remote-controlled, Class A solid-state XMAX preamps, including gain compensation for shared input scenarios. All line inputs can be controlled from a StudioLive Series III console and from free PreSonus UC Surface software. 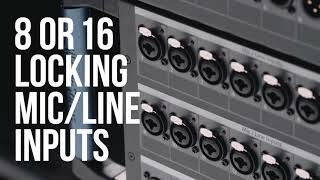 All eight outputs employ locking XLR jacks. If that’s not enough, a built-in 2-port AVB switch lets you daisy-chain multiple units, giving you enough connections for even the largest shows and installations. What makes the XMAX preamp sound so good?.